Some people have the ability to enter a room and draw instant attention, effortlessly exuding charm, radiating energy and a commanding presence. That enviable quality is called charisma…and those who have it are better able to influence what gets done and ultimately achieve what they want. To some extent, it’s innate—but with a few simple principles anyone can develop a more charismatic and compelling presence. Filled with practical, powerful tools, exercises, and assessments, The Laws of Charisma explores the vital skills and traits anyone can use to earn trust, generate interest, and motivate others. Focusing on the four core elements of charisma, this book shows readers how to: • Radiate confidence, passion, power, and optimism. • Combine purpose, creativity, competence, and focus to inspire commitment. • Influence others by improving communication skills. • Persuade and empower anyone by creating instant rapport. Charisma is the key that will unlock the door to improved relationships, greater income…and enhanced success in every area of life. 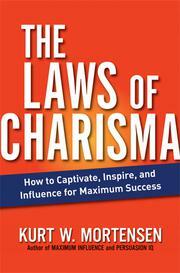 The Laws of Charisma is all anyone needs to bring out the charismatic person within.